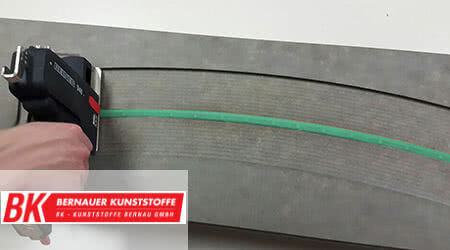 The high-quality hand stamps of REINER are characterised by their versatile application type and the durability. Whether number, date, time, text or in combination, REINER offers for your requirements individual solutions. REINER Numbering Machines print quickly consecutive numbers on your documents. All standard units feature a 6 digit number, other models go up to 16 digits. The numbers run automatically up to 5 digits, depending on the model. You can print from 000001 up to 099999 consecutively or you may choose another repetion of the numbers, e.g. duplicate, triplicate etc.. You may ask for your own choice of wheel combination with print wheels printing letters or special characters. There are also text plates available which can be engraved to your requirements. Please find the different models and sample prints below. It is fast and easy to stamp consecutive numbers and dates with REINER Dater-Numberers. Many models feature lever set date change to avoid dirty fingers. Dates are available in a wide variety of combinations and languages. Textplates can be engraved to your requirements. With the solid REINER Date Stamps you print date and text very fast and easy. You may choose from different date combinations, e.g. months in figures or in different languages. Most of our models feature lever set date change to avoid dirty fingers. Textplates are available in different sizes to allow engraving to your individual requirements. One model offer a time indicator wheel for more precise documentation. Known for their solid design REINER Mail Daters are in use all over the world. Different date combinations and sizes of text engravings in compliance with national standards are available. Special stamp pad Model 123 completes this product line. REINER manufactures your individual stamp. 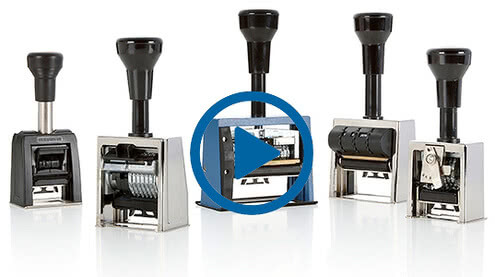 A modular system of components allows to build customized stamps quickly and economically! 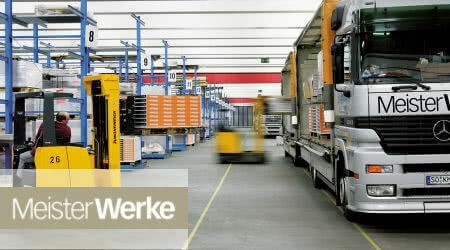 Whether rectangular, round or oblong or special combinations of wheels – REINER meets your requirements. Text plates may bear your logo, seal or signature. Please find some sample prints in the following PDF. Below, you can determine the desired accessories to match your REINER stamp. 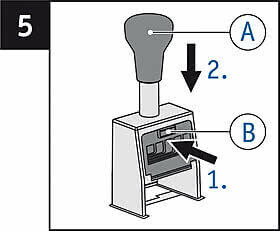 The corresponding information in the following selection windows will take you to the matching stamp accessories. > Please enter the colour of your stamp first under "cover colour". > Then select the "model" (1), the "serial number" (2) or the "type" (3). The adjacent image shows where to find the corresponding information. > The matching accessories for your stamp are output automatically. Detailed questions on your product are answered on the corresponding product page. If you have any further questions, call us or send an email. We will gladly help you. Note: Use only oil-containing stamp ink. Handle with caution to avoid dirt from ink! > Press the handle A to the bottom of its travel, then while still holding it. > Press the button B on the front plate and continue to hold it pressed. > Allow the handle A to move upwards until the handle locks in place. > Unpack the inkpad carefully. > Squeeze the grips F on the back of the inkpad and hold them. > Resting the back of the ink pad inside the pad cradle slide the pad into the slot F of the stamp. 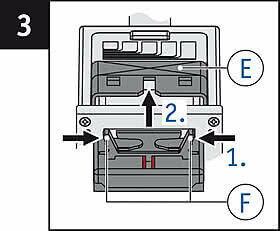 > In order to return to the print position, simply push down on handle E.
How do I lock a stamp in its parking position? To prolong the life of the inkpad, park the stamp! > Press and hold button B on the front plate. > Gently push handle A downwards until the stamp clicks & locks in a raised position. > In order to return to the print position, simply push down on handle A. Some REINER models feature a metal locking plate sitting inside the outer frame, or some older designs have a locking pin placed at the spring tube below the handle. How do I unlock a stamp from its parking position? Press back locking pin – e.g. model TA, K1. How do I adjust the number or date? > You will be able to move the stamp wheels D freely with the stylus C.
You can hide preceding zeros in a number! > To do this move the stamp wheels D with the adjusting pin C to the empty spaces between “0” and “1”. REINER date stamps feature a lever mechanism to move the date forward day by day. This lever may also be used to adjust the setting of the wheels. Just press down the lever. How do I remove preceeding zeros from a printed number? > Turn the stamp wheel D with stylus C to digit position “0”. > Using stylus rotate and push down on stamp wheel through a half digit position until it sinks below print height. > To return to the print position, simply push down on handle A. Have no drop wheels. You may remove the zero from printing by turning the wheel “half way” to “1”. Date stamps do not feature wheels that can retract. How do I set a date? REINER date stamps in general feature a lever to set the date. Just press the lever to turn the wheels. Alternatively use a stylo and refer to “How do I adjust the number or date” an “How do I lock a stamp in its parking position”. No matter if individual or serial production – an optimal finishing processing for each product is developed. Innumerable work processes are applied for this, requiring complete documentation during the order and marking for trackability of the parts. These framework conditions in turn are the perfect area for use of the handheld inkjet printer REINER 940!